SterJo Key Finder is a small key finder program that shows product keys for hundreds of games and software programs. It's available as a portable download as well as a regular installer and is licensed for both home and business use. Please read our Key Finder Programs FAQ for more information on key finder programs in general. This review is of SterJo Key Finder v1.8. Please let us know if there's a newer version we need to review. Finds Keys for Other Software: Microsoft Office versions 2013, 2010, 2007, 2003, and Office XP, plus Microsoft Money, Microsoft Works, and lots of other Microsoft and non-Microsoft programs like Adobe, Autodesk, and Cyberlink products, plus over 500 more! 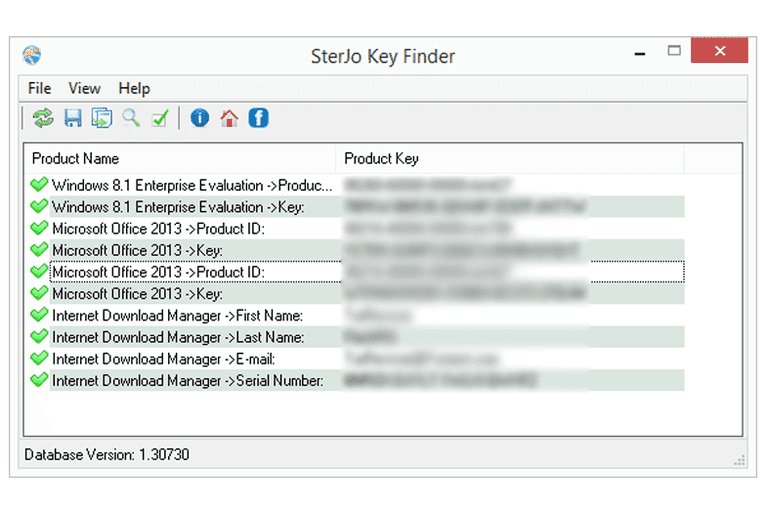 SterJo Key Finder finds the product key for more programs and games than many other key finder programs, which means it will probably be very useful for making a catalog of keys or finding install keys for more obscure programs. I like how easy it is to copy out product keys and search through the list. However, the products are grouped alphabetically only, which means the list can quickly become crowded, as several programs may also display their product ID or other registration information. Then again, you can search through the list of product keys, so it's really not all that difficult to use. I mention above that over 500 product keys can be found with SterJo Key Finder. On the list of supported programs, Microsoft Office 2013 isn't shown even though its product key can be found. This means there may be even more programs that are supported but simply aren't listed on their website. Overall, the program is pretty easy to use and can be very useful because of its vast inventory of supported products and relatively straightforward interface. Different find what you were looking for with this program? Try a different free key finder program or maybe even a premium key finder tool. The official download page doesn't seem to be 100% reliable. There's an alternative link to download SterJo Key Finder from CNET's Download.com.